Quick, easy, and hearty vegetarian meals are a saving grace for chronically hungry people who don't eat meat or those who want to improve their health. Simple meatless recipes are also helpful if you have limited time and only beginning cooking skills. EarthEasy.com: This user-friendly site has a plethora of tasty vegetarian meals that will fill up the hungriest diners. Choose from a wealth of recipes, including nut burgers made from walnuts, rice, cheese, and green peppers, which can be paired with Hearty Bean and Pasta Stew or a tofu salad. EverydayVegetarianRecipes.com: This informational website is filled with quick and easy vegetarian meal options that are fabulously filling. Learn how to make a Spanish Olive and Potato Bake that includes smoked paprika and cheese, then combine the finished product with a simple tomato soup or minestrone for a hearty lunch. 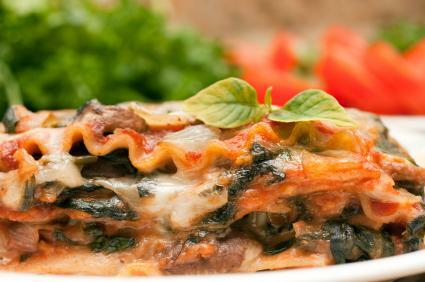 Or make an easy one-dish dinner, such as Spinach and Ricotta Cannelloni or Vegetarian Lasagna made with a variety of cheeses, kale, and squash. BetterHomesandGarden.com: The online presence of the popular magazine is an excellent resource for meatless meal recipes accessible to even the most challenged cooks. Hearty vegetarian meal options include stacked tofu with layers of sweet corn and green tomatoes or Portobello fajitas filled with grilled mushrooms and sweet peppers and topped with sliced avocados, salsa verde, and cilantro. Spend a lazy Sunday afternoon making a slew of simple vegetarian meals, and then freeze them. When you need a meal during the week, heat up a freezer portion. If you are too busy to prepare entire meals, simply work on the vegetables. Wash, chop, and cook veggies such as broccoli, beans, and carrots in large batches, and then freeze the extras to add to recipes later in the week. If certain times of the day are chaotic in your home, alternate days when you cook vegetarian dishes with days when you eat ready-made foods and prepared meals. To beef up no-cook dishes, add generous amounts of nuts, berries, seeds, or fresh veggies. Keep healthy meatless snacks on hand for kids and grown-ups to nibble so you won't feel famished when it's time to cook. Cheese, crackers, dried fruit, and yogurt are nutritious options that will help quell hunger pains and give you more time to put an entire meatless meal on the table. You don't have to readjust your work and social schedule to accommodate your decision to eat meatless. Rather, create a weekly or monthly menu and stick with it. On your busiest days, prepare your simplest recipes or go with prepared meals. Then on the days when you have more time, you can experiment with new dishes that are tasty and filling. Remember that just because you choose to be a vegetarian, you don't have to be sentenced to a life of eating salads. Keep your approach to mealtime simple, and you'ill be able to enjoy and relish your lifestyle.